When the top 24 were announced, some said that it was the best group of Idol contestants in the show’s 10 year history. The judges added three wild card picks (Stefano Langone, Ashton Jones and Naima Adedapo) to the 10 finalists chosen by America to create the Top 13. Ashthon Jones’ American Idol dreams came to an end as the Top 13 became the Top 12. Twenty-one-year-old bilingual New Yorker, Karen Rodriguez was eliminated as the Top 12 became the Top 11. When the Top 11 elimination results were announced, it was Casey Abrams who was to leave the show. But the judges used their “save” to keep Casey around. All 11 of the contestants will go on tour with two singers eliminated the following week. Two contestants were eliminated — Naima Adedapo and Thia Megia — to take the Top 11 down to just nine. No one expected it when all-around favorite Pia Toscano was eliminated to cut the American Idol field to just eight contestants. 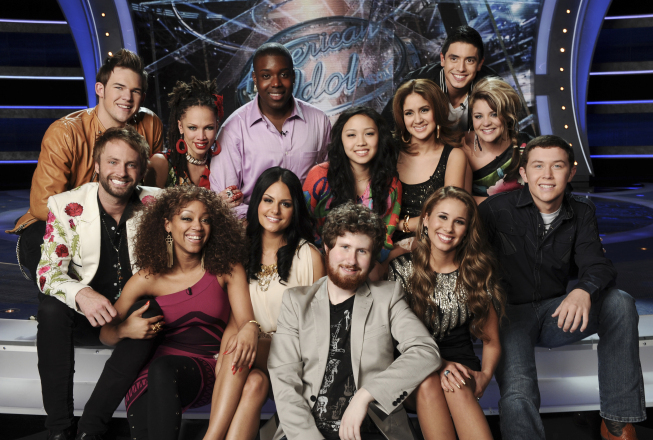 When Paul McDonald was sent home, the American Idol contestants were down to just seven. Casey, Jacob, James, Scotty and Stefano were joined by just two girls — Lauren and Haley. It was the end of the road for Stefano Langone and now just six finalists were left in Season 10 of American Idol. It was another shocker to some as Casey Abrams went home to narrow the American Idol field to just five singers. When 23-year-old gospel singer Jacob Lusk went home, only four were left standing — James Durbin, Scotty McCreery, Lauren Alaina, and Haley Reinhart (along with Lady Gaga). Four became three when rocker James Durbin was eliminated. Durbin fans (and the judges) were shocked that James didn’t make it to the finale.